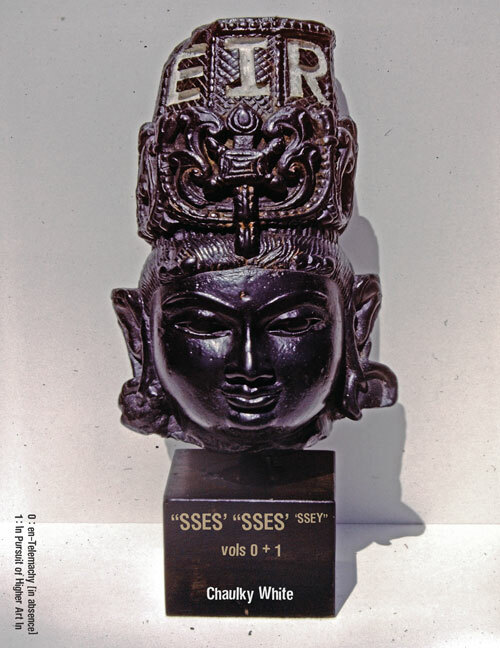 Formlessness and the rapid divergence of forms interwoven with a sequence of disjunctive media become the driving theme in ‘SSES” “SSES’ ‘SSEY”, a text rich with enigmatic endeavors to challenge the studious reader. The text and images of this collaborative book-object are extrapolated from the MFA thesis of one brother (Kevin White, older, loosely scripted as Telemachus) by the second brother (Derek White, younger, as Odysseus), and is part philosophical monograph, part travelogue, and part literary bibliography. In keeping with the experimental tradition of Calmari Press, the book is an object is a ‘deterritorialization’ of authorship itself that should find an audience among readers who are willing to have their preconceptions of book-ness smashed to unrecognizable smithereens. (Derek White, in addition to being the book’s author/assembler is also the publisher/editor at Calamari, making the process of editing/assembling/authorship/book design here thoroughly inter-penetrated). This cinching of different elements and strata reveal a kind of compositional sibling palimpsest, with the original 1990 MFA thesis ‘SSES” ‘SSES’ functioning as the first level (a collection of images and text organized loosely around the Telemachy section of Homer’s Odyssey) and the travelogue and ephemerata of a trip around the world by Derek White serving as the second, even more fragmentary layer. Kevin White died in 1997, and ‘SSES” “SSES’ ‘SSEY” can thus be read not only as a collaboration between brothers but a collaboration between life and death, presence and absence, an uncanniness that infuses the pages of Kevin through Derek, under the authorial pseudonym of ‘Chaulky White’. In an opening footnote, Derek writes: “i honestly feel (at the risk of sounding cliché) that a part of Kevin (upon his death) transferred to me like some parasitic meme transfusion (or vice-versa).” If a book can feel truly haunted (as opposed to haunting), then ‘SSES” “SSES’ ‘SSEY” achieves this in much the same way that Anne Carson’s Nox is able to place the present absence of her brother in the reader’s hands, a collection of objects, memories, journeys, and creations. White weaves this hauntedness in an intricately non-linear manner, emulating and meditating upon sections of Joyce’s Ulyesses. This allows the readers’ eye to draw numerous different lines through each single, labyrinthine page. The Homeric “Summoning the Muse” places us squarely within the philosophical vocabulary of Gilles Deleuze and Félix Guattari, where the sequence of actions is rendered as spatial variations upon temporal themes. Here the two brothers’ different ephemerata suggest themselves as fundamentally improvisational acts (think: be-bop, jazz), Nestor as “Rhizomatic Shattering” and Proteus indicated as a movement between plateaus (refer to Deleuze & Guattari’s A Thousand Plateaus). From there the reader is shot twice around the world, once with Derek’s travelogue as he picks his way through adventure, exploration, and meditation and once via the letters and accumulations of Kevin, whose 1985 world trip pre-dated Derek’s by five years. This is not an easy book, as the author is him/themselves well aware, writing (under erasure):” Mostly i am writing this for myself, so i apologize if it doesn’t make sense to u.” However, if one is able to follow the advice given by Brian Massumi to readers of Deleuze and Guattari, to read the book more as one would listen to a record, to go along with it for a time, put it aside, pick it up again and meditate upon the haunted character of White’s intricate and haphazard prose. Then, as with listening to music, stabilizing the text’s interpretation may no longer remain the reader’s dominant priority. Edmund Zagorin is a writer based in the Midwest, USA. His work has previously appeared in Joyland, Voiceworks, Cafe Irreal, Chicago Literati and the anthology Writing That Risks (Redbridge Press, 2013). Find his work on the web at storiesbymail.tumblr.com, @storiesbymail.